Former racer Phil Armes will make an emotional return to the Manx Grand Prix when he will ride in the Past Winner's Lap Parade. Phil's participation in this event would, in all other cases, probably go relatively unnoticed. However Phil is confined to a wheelchair after a racing incident saw him paralysed from the waist down in 1995. So for him and many who know him this is a special event. 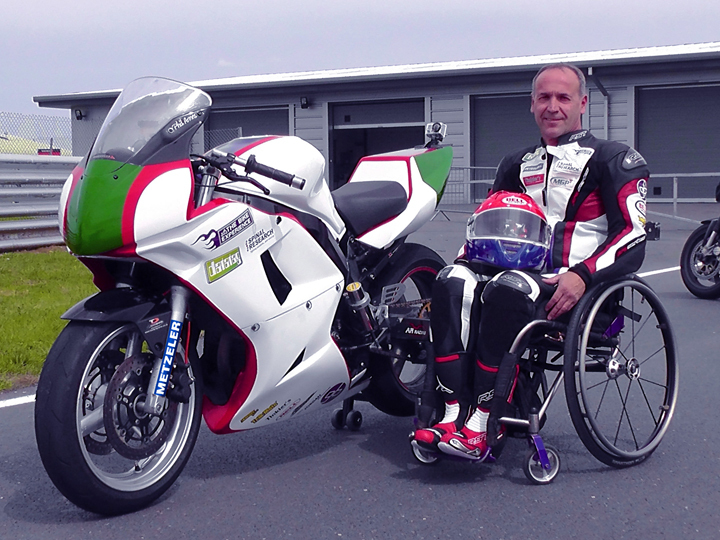 Phil will ride a modified Suzuki SV650 which belongs to Talan Skeels-Piggins, a fellow wheelchair user. "When I broke my back I'd achieved most of what I was ever going to, so I saw no reason to get back on a bike – unless somebody offered me the chance to do a lap of the Isle of Man!" said Armes. Having won Manx and Macau Grand Prix titles, ridden Formula One bikes and held Isle of Man TT lap records ahead of legends such as Joey Dunlop and Carl Fogarty jumping on a bike again after such an accident was understandably daunting. However in April this year Armes faced his fears and at Silverstone rode again for the first time since his accident "Getting back on the bike and riding off that very first time knowing you can't put your feet down was possibly one of the scariest things I've ever done on a motorcycle. But at the same time it was one of the most satisfying too, and also quite a melancholic moment. A lump in the throat definitely. To get back on a bike, it was something I probably thought I would never do again." However, remembering the rides of his past it wasn't all plain sailing "But on the way home I'd never felt so frustrated either, even with all the things I've taken on in my life, because I knew how I used to ride a bike." Spurred on by his racing never say never attitude Phil persevered and soon the skills he'd honed started to come back. "But the second time at Silverstone I was a lot quicker, safer, and smoother and I came home with a smile on my face that time. I've had two more at Snetterton since then, and I'm already to go to the Isle of Man at the end of August." Datatag have provided support to Phil in his quest to get back on a bike and Managing Director Kevin Howells said "I've known Phil for many years now and to be able to help him realise such a dream was an easy decision. I can't imagine what will be going through Phil's mind on this lap but we are just proud to have played a small part in helping to make it happen. In spirit at least everyone at Datatag will be riding that lap with him!" "It's been almost like starting from scratch. And with the actual lap, the TT goes up into the mountain and down again," said Phil. "There's Ballaugh Bridge to overcome, which people jump over – and I'm not going to be able to do that. So I have my concerns as we've got to make it as safe as possible. But am I looking forward to it? You bet." 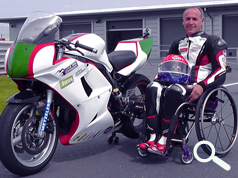 Phil's lap of the famous Isle of Man circuit will be the first for a paraplegic rider and will no doubt inspire many who, like Phil, have been injured doing what they love most – riding bikes.